A perception of insecurity is growing in the center of Merida, so citizens propose the existence of a single law enforcement command and the disappearance of the municipal police, after considering that it has shown its incompetence to not be able to provide security to the more than 200 thousand people who walk daily through the central blocks of the city, where in days past a murder occurred in broad daylight. The leader of the Institutional Revolutionary Party (PRI), Alfonso Seguí, said that the crime that prevails in the central zone, especially in the area of the city’s markets, makes imperative the construction of a police station. On the subject, tenants of the old market (‘Lucas de Gálvez’) and the new (‘San Benito’) agreed on the urgency of a police booth with all the personnel and equipment to protect the more than 200 thousand people who daily arrive in the city’s center, whether to work, to do errands or to make connections to other points. He recalled that they have long proposed to install a municipal police booth in those markets, but the authorities of the City of Merida have ignored these requests. 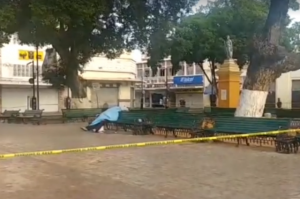 Meanwhile, in the pre-dawn hours of Friday Feb. 17, a man was found lifeless on a bench in Eulogio Rosado Park located near the entrance to the markets. The 40-year-old man had a puncture wound in the leg; the wound reached the femoral artery, causing him to bleed to death. Police are reportedly investigating robbery as a possible motive for the assault on the victim.